Let’s face it—hard disk-related activities can never be simple, especially when that disk has data on it. In this article, we’ll take a look at some of the tools that can make these activities easier. There have been many operating systems and live CDs that provide partitioning utilities. Often, they turn out to be either proprietary or not able to support all filesystems used for Linux, Solaris, etc. But GParted is one such important partitioning utility that supports many filesystems and comes with a friendly user interface. GParted (Figure 1) stands for ‘GNOME partition editor’. With it, you can create, modify and delete partitions. Although you can definitely install it on any distribution and run it, I wouldn’t recommend running it on a booted OS as problems might occur with certain mounted partitions. A better solution is to run GParted from a live CD. GParted itself comes on a separate live CD; boot it and double click on the GParted icon from the UI presented. It is also a part of a live CD called System Rescue CD. To run GParted from here, first start X by issuing the startx command, and then open the GParted application from the X terminal. It can also be run from a bootable USB drive or via a PXE boot. To create a new partition table (by erasing the old one, if one exists). Use this option very carefully. Unlike other operations, Undo is not supported for this. A new partition can be created from unallocated/free space. Decide on new partitions as primary, extended or logical, as required. To delete an existing partition. 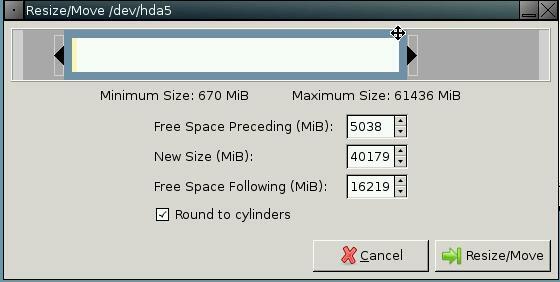 To resize/move existing partitions (Figure 2). Sizes can be increased only when free space is available on any adjacent side. To change flags/labels of a partition. 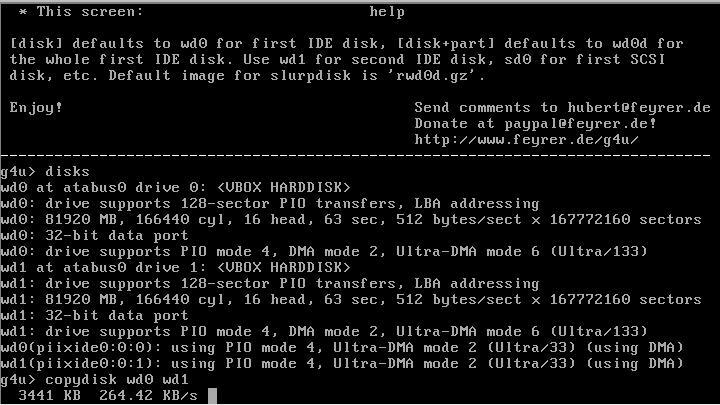 To format a partition to any supported filesystem—ext3, reiserfs, etc. To check filesystems for errors. All requested operations are added to the pending queue, which is performed in sequence upon clicking the Apply option. The following filesystems are supported by GParted presently: btrfs, crypt-luks, ext2, ext3, ext4, fat16, fat32, hfs, hfs+,jfs, lvm2 pv, ntfs, reiser4, reiserfs, swap, ufs and xfs. Check GParted.sourceforge.net/features.php for individual support of each filesystem and for updates. g4u is a disk cloning software. It is helpful in larger organisations like educational institutes where there are several machines of identical configuration. Every system may need multiple operating systems along with some updates and customisation. Repeating these for every system is a tedious task. So cloning is a good technique to avoid such problems by copying many disks from one fully prepared one. Also, when one or more operating systems crash on one system, it can be recovered quickly by copying the OS from an identical system. This software has a few advantages over other cloning utilities. One is that it’s free. Second, it is independent of partitions, filesystems and operating systems that exist on a disk, as cloning is performed block by block. The only requirement is that the target disk should be larger than the original disk. g4u comes as live media, in the form of two bootable floppies or a bootable CD. The images for floppies/CD can be downloaded from www.feyrer.de/g4u/#reqs. As of today, the latest stable version of g4u is 2.3. Disk cloning can be done in two ways — locally, by connecting two or more disks to a system at a time, and remotely, where the image of the original disk is stored on an FTP server, which is used for other disks to be copied using FTP. disks lists all connected disks, and specifies identifiers for each. IDE hard disks are identified by wd0, wd1, etc, whereas SATA disks are identified by sd0, sd1, etc. Here, wd0/sd0 represents the first/primary hard disk. parts <disk-name> lists the available partitions in a specified disk. For example, parts wd0 lists partitions of disks identified by wd0. See Figure 3.
copydisk <disk1> <disk2> copies all data from disk1 to disk2, block wise (Figure 4). For example, copydisk wd0 wd1. It is preferable to run g4u in a DHCP-enabled network if FTP transactions are planned. If DHCP is not available, the network needs to be set up manually.